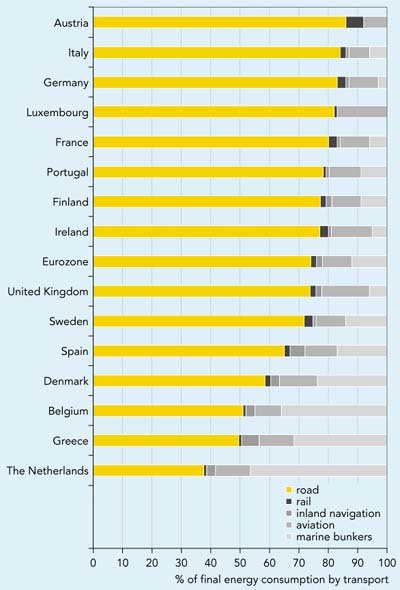 Transport is one of the main energy-consuming sectors in the EU (over 30 % of total final energy consumption in 1997). Its energy use is growing at about 3 % per annum. Road transport is responsible for 73 % of transport energy consumption. Note: Oil and gas pipelines account for only about 0.3 % of total energy use by transport and are not included in the chart. Reduce consumption of fossil energy by transport. Final energy consumption by transport mode (road, aviation, marine, rail and inland waterways), expressed in million tonnes of crude oil equivalent (mtoe). Note: marine bunkers (the amount of energy carried in marine bunkers) does not necessarily reflect the marine activity of the country in which the bunkers are located. The same may be true, to a lesser extent, for aviation. Data for inland waterways may include some coastal shipping. Transport is nearly fully dependent on fossil fuels (99 %), and contributes significantly to emissions of greenhouse gases, acidifying substances, ozone precursors and other air pollutants. The Common Transport Policy. s action programme highlights the need to . reduce the dependence of economic growth on increases in transport activity and any such increases on energy consumption. and calls for the development of . less environmentally damaging energy alternatives. . An important policy development is the voluntary agreement with the car industry (CEC, 1998b), which aims to reduce CO2 emissions from new passenger cars (and therefore reduce energy consumption). the Italian Government has developed a voluntary programme, jointly with the major Italian manufacturer FIAT, to make more efficient vehicles available. In addition to technological improvements, some Member States are implementing other measures to improve the sector. s energy efficiency, such as promoting public transport, rail and inland waterways, financial support for the purchase of fuel-efficient vehicles, traffic control and rationalisation of urban transport. Energy consumption by the transport sector reached 329 mtoe in 1997, or some 34 % of total final energy use. Transport is the fastest-growing energy consumer in the EU: its consumption grew by more than 42 % (3 % annually) during 1985-1997, while consumption by the remaining economic sectors rose only 11 %. Per-capita energy consumption by transport in the EU (1995) was slightly below the OECD average. Growth in road transport is the main cause of the increase in energy use: the increasing use of heavier more powerful cars and trucks along with low occupancy rates and load factors have offset improvements in fuel economy . mostly related to engine technology (see Indicator 20). Aviation and marine bunkers are also contributing to the sector. s growing energy use. inland navigation increased steadily in France (by more than 160 %) and, to a lesser extent, in Spain, Belgium and Greece (between 50 and 100 %), and decreased only in Portugal, Finland, and notably in Germany and Sweden. 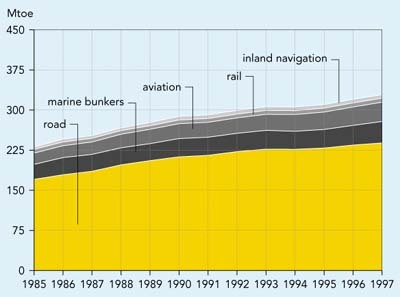 In 1997, road transport was responsible for 73 % of the energy use of the EU transport sector, marine bunkers for 12 %, aviation for 11 % and inland navigation and rail transport for 2 % each. Differences between countries are illustrated in Figure 1.3. No breakdown of energy data for passenger and freight transport is available at Eurostat, but IEA data shows that passenger transport accounts for 55 to 65 % of total energy use by transport. Energy use by freight is growing at the fastest rate. Energy use by transport comprises not only direct consumption (vehicle operation) but also indirect consumption from primary fuel production (extraction) and transformation (refineries, power generation, etc. ), infrastructure and vehicle manufacture, maintenance and disposal, etc. Primary energy consumption would therefore provide a better basis for comparing transport modes. However, such statistics are currently only available in a few countries and are not always comparable. Efforts are needed to improve methodologies and data to develop an EU appraisal of energy consumption by transport from a life-cycle perspective. No split of energy consumption according to freight and passenger transport is currently available at Eurostat. Such information would enable a better assessment of energy consumption by freight and passenger transport. Note: Consumption of marine bunkers, and consumption of oil and gas pipelines (declared only by Belgium, France, Italy and the United Kingdom) is included. For references, please go to https://www.eea.europa.eu/publications/ENVISSUENo12/page006.html or scan the QR code.